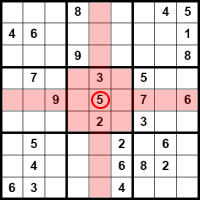 A Sudoku consists of 9 x 9 fields, which are divided additionally in 3 x 3 blocks with 3 x 3 fields. Each line, column and block contain all numbers from 1 to 9 exactly once in each case. In a few fields are already numbers given. 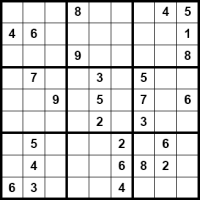 The degree of difficulty of a Sudoku depends on the number of given numbers or in addition, on the position of the indicated numbers. In a Sudoku there may be only one possible solution, and this must be able to be found purely logical! Since each number per line, column and block may occur only once, the positions for other numbers of this value can be excluded by given numbers. Presented example shows that the 5 in the field ecactly in the middle blocks the position for the other fields. In the red range the 5 can't stand in no case further! Scanning is a technique to solve a Sudoku. 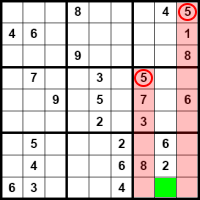 In our Example sudoku you can determine the position of the 5 in the right lower block by the given numbers completely clearly (green mark). All other fields in the block are filled out or blocked by a 5 in the respective colums. Also no other number can be located in the field, since in this block must be located to 5, and it is only in this field possible. So you can fill gradually even more fields, by repeating this scanning again and again for all numbers. An other technique ist he counting of the numbers witch are missing in a row, colum or block to exclude their positions. A how to use these solving techniques is shown at the Sudoku Howto. A quite space-saving method to notice the positions for a number is the hand line method. Here will be marked in the appropriate fields by clockwise direction the possible numbers for each field. For the number 5 you place a dot into the middle of the field. If later in the solution an other number will recognized to be excluded you can easily cross out the marking. An other aid for scanning are paper strips,you can cover with them simply the fields, which are blocked by the number. So the scanning does not have to be accomplished completely in thoughts. Also a negativ raster can be used. You divide each free field into 9 subregions, each subregion stands for a possible number. A inserted marking, e.g. a diagonal stroke for the numbers of those could there be excluded in each case in the subregion for a number. This method can natural be still refined, so that you mark a cross e.g. for numbers which can be excluded and for possible numbers a diagonal stroke. Wich of those utilities you use, how to use the utilities or modify these utilities is all at your descision.